Above and beyond the lives lost, ruined or truncated because of our pursit of nuclear weapons, consider the sheer opportunity cost. So we're going to upgrade our "weapons delivery systems" for $1T? Where will that money be coming from when we can't fix a bridge? Your retirement? Kyoko Hayashi nearly died on August 9, 1945 in the atomic bombing of Nagasaki. She was fourteen years old and working at a factory less than a mile from the epicenter of the atomic explosion. She traveled barefoot for nine hours through the ruins of Nagasaki passing many dead and dying who had been crushed, burned and wounded. Fifty four years after surviving the bomb, Hayashi journeyed from Japan to the Trinity Site in New Mexico, the site of the first atomic bomb explosion, a national landmark since 1975, and “a hibakusha’s birth place,” as she deems it. She may be the sole survivor of the atomic bombs to have made this morbid pilgrimage. This morally corrupted compass–contravening all international conventions of war–set the course for Vietnam, Korea and Iraq. Most recently, William Perry, the highly respected former defense secretary in the Clinton Administration, offered a bleak and chilling assessment: “Today, the danger of some sort of a nuclear catastrophe is greater than it was during the Cold War and most people are blissfully unaware of this danger.” (8) “Our chief peril,” he writes in My Journey at the Nuclear Brink, “is that the poised nuclear doom, much of it hidden beneath the seas and in remote badlands, is too far out of global public consciousness. Passivity shows broadly.” (9) Only by dumb luck, he adds, have we escaped nuclear war thus far. Contrary to government and defense industry group think, nuclear weapons do not provide security, they only endanger it. Pick your issue of Americans’ insecurity and suffering: 20- for Black children), paychecks that working people cannot live on, costs of education and housing, climate change, prison reform, human trafficking…and imagine what our trillion dollar taxes targeted to modernize nuclear weapons and police the world militarily could do re-invested in what the majority of Americans need and want for a sustainable and secure future. 1. Kyoko Hayashi. Trinity to Trinity. Translated by Eiko Otake (2010) Barrytown, NY: Station Hill Press. Originally published in Japanese by Kodansha 2000 as Torinichi kara Torinici. 2. Rachel Carson. 1962. Of man and the stream of time. Scripps College Bulletin. July, pp.5-10. 3. 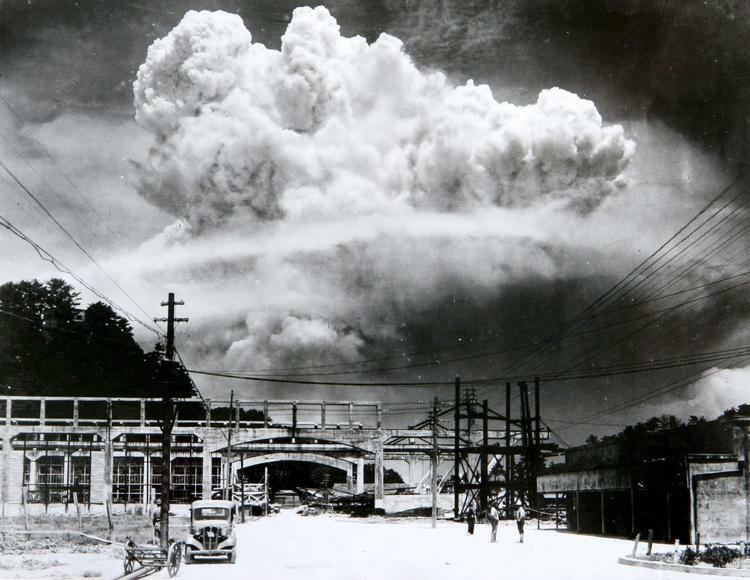 [url=https://www.thenation.com/article/why-the-us-really-bombed-hiroshima/]https://www.thenation.com/article/why-the-us-really-bombed-hiroshima/[/url]. Viewed July 15, 2016. 4. John Dower. 2015. Cultures of War: Pearl Harbor/Hiroshima/9-11/Iraq. New York: W.W. Norton. 5.http://www.nuclearfiles.org/menu/library/biographies/bio_byrnes-james.htm. Viewed July 20, 2016. 6. Peter Wyden. 1984. Day One: Before Hiroshima and After. New York: Simon and Schuster. pp.362-366. 7.http://www.pbs.org/wgbh/amex/bomb/filmmore/reference/primary/leebutler.html. Viewed July 15, 2015. 8. William J. Perry. “A National Security Walk Around the World.” 2016 Drell Lecture. Center for International Security and Cooperation. Stanford University. February 10, 2016. 9. Jerry Brown. A stark nuclear warning. Review of William J. Perry. 2016. My Journey at the Nuclear Brink. Stanford, CA: Stanford Security Studies.http://www.nybooks.com/articles/2016/07/14/a-stark-nuclear-warning/. Viewed July 24, 2016. 10. http://historynewsnetwork.org/article/162279. Viewed July 23, 2016. 11. http://www.businessinsider.com/major-study-finds-that-the-us-is-an-oligarchy-2014-4. Viewed July 22, 2016.
http://scholar.princeton.edu/sites/default/files/mgilens/files/inequality_and_democratic_responsiveness.pdf. Viewed July 22, 2016.